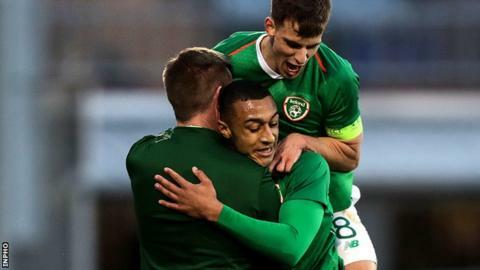 The Republic of Ireland Under-21s beat Luxembourg 3-0 in their first Euro 2021 qualifier to give Stephen Kenny a winning start as manager. Norwich striker Adam Idah, 18, scored either side of Neil Farrugia's strike at the Tallaght Stadium in Dublin. The win sends the Republic to the top of Group One, which also contains Italy, Sweden, Armenia and Iceland. Kenny will succeed Mick McCarthy as the Republic's senior manager for the start of their 2022 World Cup qualifiers. The hosts were in control from the opening minutes as Idah and Farrugia both had chances in the first 10 minutes to give their side the lead. Idah eventually broke the deadlock in the 34th minute with a powerful header from Farrugia's corner and the UCD striker turned from creator to goalscorer just four minutes later with a dinked finish from Connor Ronan's pass. Watched by McCarthy and his senior coaching team, the Republic's Under-21s continued to dominate after the break and Idah scored his second in the 67th minute with Ronan once again the provider in a quick counter attack. "I thought we were excellent at times, some fantastic spells of play and I thought the quality of goals were fantastic," said Kenny.